Disney Parks isn't letting Han Solo or Luke Skywalker save the day at their new Star Wars-themed lands. "When you step in to the world, you're the hero," Chris Beatty, Disney Imagineer and executive director of the new expansions said. Beatty was just one of many Disney representatives who spoke Saturday on the new Star Wars-themed lands at the Disney fan expo D23 in Anaheim, California. Bob Chapek, Walt Disney Parks and Resorts Chairman, led a joyous panel where he unveiled many new projects for both domestic and international parks. New "Ratatouille," ''Guardians of the Galaxy" and "Tron" attractions are headed to Walt Disney World in Orlando, Florida. Discussion of the Star Wars land came early in Chapek's presentation, pleasing an eager audience. A video detailed a model on display at the expo's "A Galaxy of Stories." Then, Chapek revealed the name for the expansions. Star Wars: Galaxy's Edge will first open at Disneyland, followed shortly by a second, identical location at Hollywood Studios at Walt Disney World. Chapek said both are expected to open in 2019. He introduced the lead designer of the project, Scott Trowbridge, who said Galaxy's Edge focuses on two major rides allowing guests to lead their own adventures. The first is a battle between the Resistance and the First Order. The second allows riders to take control of the Millennium Falcon. Trowbridge echoed Beatty's sentiment that Galaxy's Edge is all about the guest experience. Beatty said developers quickly ruled out focusing on any specific film or character arc in the franchise. Instead, they're building a brand new, unnamed planet. The new planet is set on the outer rim of the galaxy, hence the name Galaxy's Edge. Beatty said they created a place where both beloved characters from the franchise could mix with new, unknown members of the galaxy. He called it "a smuggler's planet," something quintessential "Star Wars." "It's kind of forgotten about. People in the know like Han and Chewie, they knew of this place," he said, referencing beloved franchise characters Han Solo and Chewbacca. Beatty didn't rule out the possibility of Galaxy's Edge appearing in an upcoming "Star Wars" film, though he didn't reveal any current plans. Lucasfilm's developers and writers worked closely with Disney's Imagineers on the expansion. During his presentation, Chapek also announced many characters from the films will be featured in Galaxy's Edge, including BB-8, Chewbacca and Kylo Ren. But it was the droid Rex that received the biggest applause from the audience. Rex may serve as a DJ at a cantina in Galaxy's Edge, Chapek said. The chairman also announced a Star Wars-themed luxury resort at Walt Disney World, which he says is "100% immersive." Chapek did not announce an opening date or if construction is ongoing. The Star Wars-themed lands were first announced at the 2015 expo. 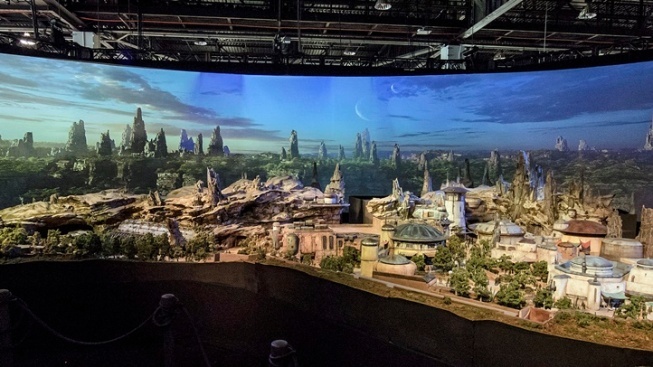 During the 2015 expo, Disney announced the themed lands among a slew of "Star Wars" park expansions, including the interactive Star Wars Launch Bay and a seasonal event, Season of the Force. They also updated the Star Tours ride, Disney's first Star Wars-themed ride installed in 1987. At 14 acres, Galaxy's Edge is Disney Park's largest single-themed land expansion. "It's got to be big. Go big or go home with 'Star Wars,'" Beatty said.